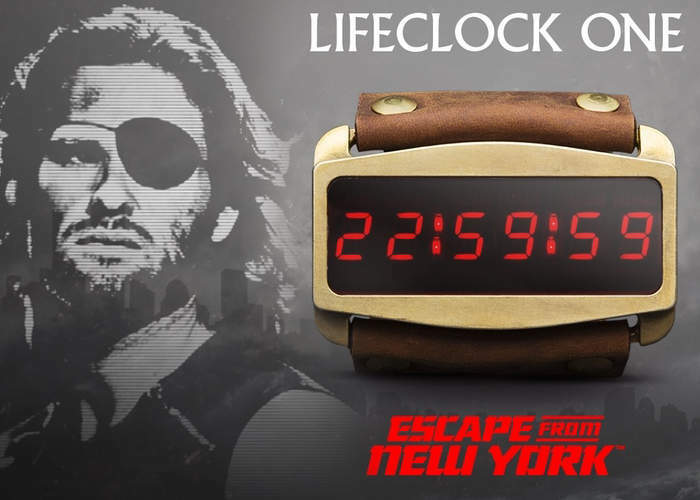 Fans of Snake Plissken and the Escape from New York movie are sure to love this new smartwatch which has been inspired by the movie. The aptly named Lifeclock One the smartwatch sports a similar design to the one worn by Snake throughout the movie to remind him just how much time he has left before the explosives injected into him will rupture his arotid arteries. Watch the demonstration video below to learn more about what you can expect from this replica smartwatch which has taken to Kickstarter to raise the $200,000 it requires to go into production. After just a few days the awesome Lifeclock One smartwatch has already raised nearly $60,000 thanks to over 180 backers. Funding on the campaign will stop on December 8th, 2016 giving you plenty of time to decide whether you’d like to make a pledge for $399 or not. Features of the smartwatch include eight world clocks, stopwatch, push notifications, application notifications, weather, compass, step counting and even camera control. Shipping of the smartwatch is expected to take place during May 2017 and worldwide shipping is available. The creators of the Lifeclock One smartwatch explain a little more about its features and functionality. The Lifeclock One is a unique watch that’s not only smart but attracts attention. Designed, assembled and tested in the United States, it’s the coolest looking smartwatch you’ll find on the market today. When the Lifeclock One screen powers up, you better not be shy because you’re going to get attention — lots of it. The crisp, vibrant displays will attract the gaze of everyone in the room — and it gets even better at night. LED watches have never looked this cool.